MLNP: its almost (Scene) Sunday!!! 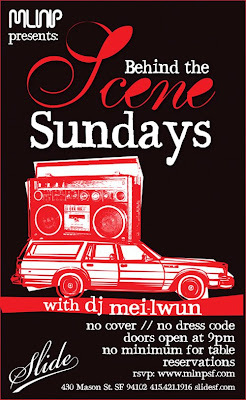 Join MLNP's hostess with the most Nadia Patel and resident party rocker Dj Mei-Lwun along with special guest Dj J Espinosa for SCENE Sundays @ Slide July 26th. Email for table reservation mlnpsf@gmail.com and join the MLNP VIP list for free entry. 9-2 am 430 Mason St SF SLIDE +21. Come as you are.